Droom champions the cause of vehicular rights by launching ‘Save Our Vehicles’! Vehicle abuse, today, is an ugly truth that haunts our society. Every day we see vehicles crashing and burning in the most ridiculous fashion in movies, while in real life, vehicle owners are often seen not paying the required attention to the maintenance of their prized possessions. 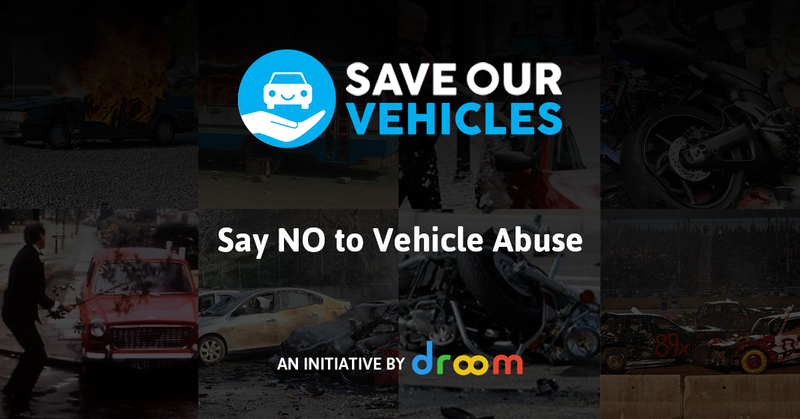 It is to counter these instances of vehicular abuse that Droom, India’s most trusted motor place, has launched Save Our Vehicles (SOV), a non-profit Indian vehicle rights organisation based in Gurgaon. The organisation will help in creating awareness among all vehicle owners about the needs and requirements of the vehicles and make the world a better place for vehicles to be in. Droom is the first and only group in the world to champion the cause of vehicle rights and equal opportunity for vehicles. Through this initiative, the brand will deliver a strong message to educate policymakers and the public about this highly sensitive issue and raise awareness and understanding about the rights of all vehicles. The government is also being petitioned to set up a commission to set guidelines for, and to oversee, use of vehicles by the entertainment industry. To support the movement, Droom has integrated an Emergency S.O.V. button in the Droom mobile app, which can be used by vigilant citizens across India to report any vehicle abuse they come across along with images & videos of the act. Once the concern is raised, Save Our Vehicles task force members will reach the spot using geo-location to ensure justice for the vehicles in question. The task force can also be reached at 024-61024010 or #SaveOurVehicles #Droom. So if you are a conscientious car owner or even just a concerned enthusiast, join the movement and add your voice with a growing community of car lovers. The ‘Best Offer’ Format Offered by Droom Just got Better!